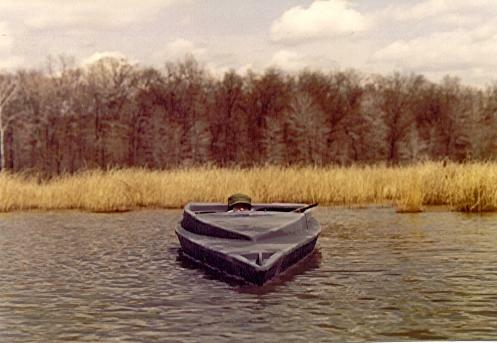 "THE BRANT I" is a 1-man scull boat designed by Lock Stock and Barrell, Inc. to meet the demanding needs of the modern waterfowler. The hand-laid fiberglass construction offers the sculler a safe and durable craft. The versatile Brant I can also be used for layout as well as marsh hunts. The spacious cockpit, molded shell boxes, and integrated motor mount are key design features for the convenience and comfort of the waterfowler. The forward lead ballast weight is not included in shipment due to the added weight. A mold has been included at no extra charge so that this ballast weight can be easily made.